Toothbrush – To clean your pet’s teeth, use a moistened toothbrush designed specifically for dogs. Also, select a toothbrush that has soft bristles to prevent any gum irritation. Toothpaste – For starters, never use human toothpaste for your dog, as it can be harmful. Instead, you can purchase pet toothpaste, which will usually be flavored like poultry or malt to make it more appealing. Start with a sample – If it’s your first time brushing your dog’s teeth, then introduce a small amount of toothpaste so he or she can adjust to the new experience. Expose the teeth – So that you can properly clean the teeth, you’ll need to gently pull back your pet’s lips to expose the digits. Be gentle – It’s important to always be gentle when brushing your dog’s teeth. Thus, you won’t have to worry about damaging the soft tissues. Stay on the outside – When brushing, be sure to stay on the outside of your dog’s teeth. More than likely, attempting to brush the inner surfaces will irritate your pet. Reward your dog – When everything is done, reward your dog for being obedient and compliant. Thus, when it’s time to brush his or her teeth in the future, both of you will enjoy a smooth process. How Often to Clean Your Dog’s Teeth? Your Boiling Spring’s dentist recommends that you clean your pet’s teeth every day. 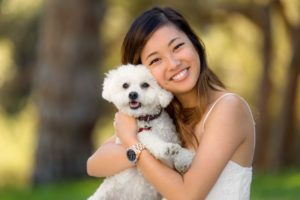 If that’s not possible, then you can supplement with chew toys and a special dental diet that will help to limit the plaque and tartar accumulation on your dog’s teeth. Your pet is a special addition to your family, which is why you want him or her to have the best care possible. By following the above guidelines, you can accomplish your goals! Dr. Thomas Neslund earned his dental degree from the University of Pittsburgh School of Dental Medicine, and he has gone on to provide expert care to the Carlisle community for the past two decades. With extensive training and experience in several areas, including restorative, endodontic and pediatric dentistry, Dr. Neslund offers his patients comprehensive care. He practices at Carlisle Family & Cosmetic Dentistry, and he can be reached for more information through his website.